If you’re a keen watcher of the US Federal Communications Commission (FCC), then a new device from Shenzhen SEI Robotics Co., Ltd. labelled a ‘4K ATV Stick’ will probably have piqued your interest, with the external photos showing off a HDMI dongle, with Google Logo running the latest version of Android TV and with a Google Assistant enabled voice remote. 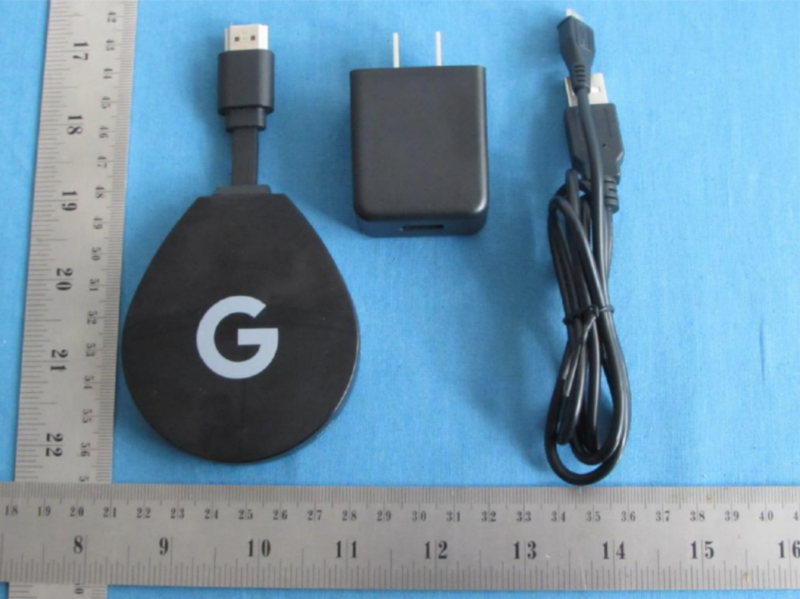 As you can see from the images the dongle is extremely reminiscent of the Chromecast dongles that have been massively popular for Google, gaining them a sizeable foothold in living rooms around the world. The dongle has a HDMI (2.0A) output, power (5V/2A) input and according to the user manual is powered by an Amilogic S905X processor with 2GB of RAM and has 8GB of eMMC storage on-board. The dongle’s power brick shows no sign of an ethernet connection like the Chromecast Ultra, but the dongle includes dual-band Wi-Fi 802.11 a/b/g/n/ac and Bluetooth 4.1 as well. 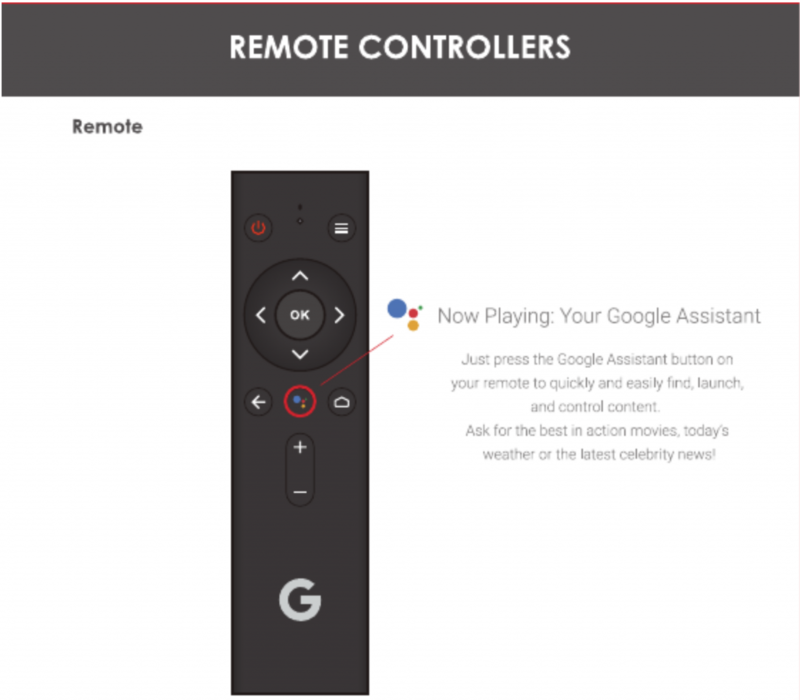 The user manual, which you can read through here, also shows the Android TV setup, including the Google Assistant enabled remote control which features a power button, what appears to be a hamburger menu, a D-Pad with a Back, Google Assistant button and Home button below, and either a volume or channel up/down control underneath. The setup process appears to be fairly straightforward using the voice enabled Android TV remote above, and an Android device. The screenshot of the Android TV home screen shows the Oreo updated version of Android TV that was launched at Google I/O last year. Since their previous reference device for Android TV, the Nexus Player, was confirmed to not be receiving any further updates last month, Google has really been in need of a device which developers can use. This dongle could be it. 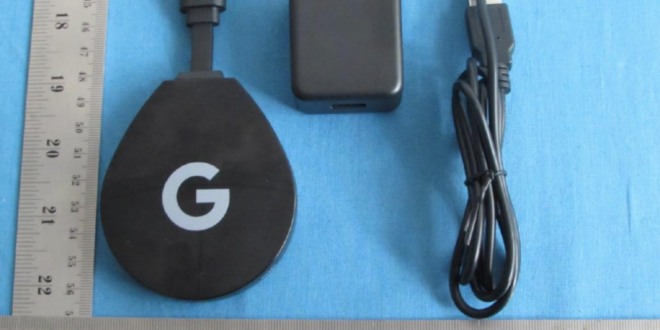 It’s been submitted by another party, Shenzhen SEI Robotics, who have a number of Android TV devices already in production, but that’s a pretty distinct Google logo front and centre on the device. With Google I/O only a few weeks away, this could be a developer focused device similar to the ADT-1 developer box seeded to developers after announcing the platform at Google I/O in June 2014 – but we hope it’s made available to consumers. As of this morning, the FCC has made the images private for 180 days. The only remaining one is the FCC label location image which is usually shown in most FCC filings even if everything else is private. In other news, it appears Google has replied to Android Police about the leaked device, advising that ‘the company does not comment on rumors or speculation’. The remote looks very similar to the Xiaomi Mi Box remote. This one has an extra button top right and the voice (assistant) button and home button are swapped around. The adapter and cable’s design are far from Google’s offering as of this date. The Engrish description says fake again. Not a google device it seems. Personally I’m waiting for google to produce a 4K Android TV/Chromecast/Google Home device, controlled by voice alone. 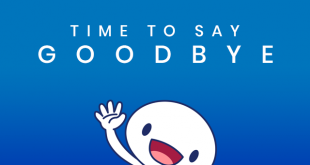 Thanks to the power full Android platform, the media box convert your TV set to smart screen. I’d also say that the design does not look Googley to me. 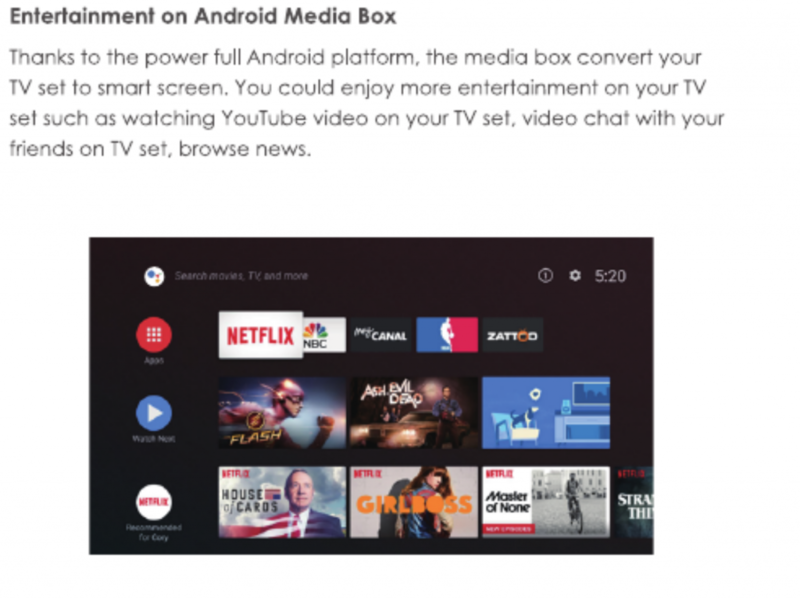 And there are already a ton of small Android TV boxes out there.